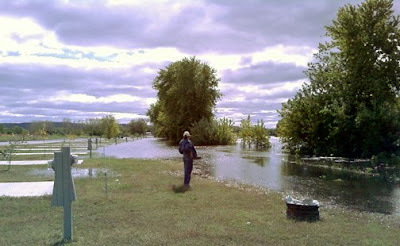 TheWanderer: Mississippi River RV Lot Finally High and Dry! The Big Muddy has finally decided to return to its proper banks and we were able to occupy our lot on the Mississippi this week. While our lot was not flooded, it was high enough to cover the lower reaches of the park and all services, (water, sewer, electricity), were cut off until the water abated. The Mighty Mississippi right out the window! This is a Park still under development, so it does not have any amenities yet, but we got our pick of the lots by getting in early and we chose to be on the very end, so we have a very large yard on one side, and a very unique yard ornament. Out our window is an old plant of some sort, it will be torn down eventually, but I like it's old rusty skeleton, for now, and rather picturesque. This area in Prairie du Chien, Wisconsin was industrial for many years, it hosted a barrel factory, and clam shell button industry and several other businesses that were served by barges on the river and an old abandoned rail line nearby. The city has worked on reclaiming the land for years, but is subject to seasonal flooding, so the uses are limited to recreational and seasonal. This year was a good case in point, waters have covered the roads into this area for a good month, so we couldn't get in, but now that they have receded, we can get on with enjoying our Summer here. We will be staying here for at least two months now, and hopefully we will get to spend more quality time later in the Summer too. Our calendar is a bit full this year with Events almost every weekend this Summer. Many times it is more convenient just to move from one Event to the next rather than come back to our lot, but as time goes on, we hope to spend more and more time here.